Previous: Breastfeeding Tips to Know *Before* Baby Arrives. Perhaps you’ve changed your diet. Perhaps you’ve changed your exercise routine. Or coffee intake or sleep habits, or any number of little lifestyle adjustments to have a healthy pregnancy. I know you have a lot on your plate, my pregnant friend, but I’m just going to throw one more thing onto it—stress management. Stress management is an important component of a healthy pregnancy but seems to be left out of the conversation. And managing your daily stress may be just as important as eating that kale salad or going for that 30 minute walk. A healthy mama for a healthy baby. Decades of research has tied stress to health, regardless of whether or not you are de-stressing for two. Stress can run down your immune system, causing you to get sick more easily. Stress can flare up an autoimmune disease or contribute to hypertension. Stress can disrupt your sleep. Stress can affect your mental health. 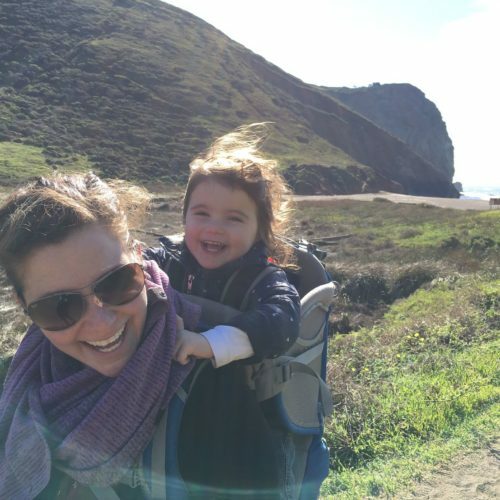 During pregnancy, your body is already over-taxed—after all, you are building a human being from scratch!—and your body prioritizes building that tiny human at the expense of your own health. By simply being pregnant, your immune system is now sub-par, your sleep patterns are crappy, your brain is juiced up on hormones, and your cardiovascular system is working overtime. Your pregnant body is a smoldering fire waiting to flare up with any little health issue. Think of stress management as a way of dampening the flames. Keep the fire at bay. Stay as healthy as you can. Take that extra deep breath or find the tricks and tools that work for you and your daily stresses. When stress doesn’t equal stress—How to keep track of your stress levels. Stress is a tricky health parameter to track because everyone is a bit different with how they internalize it. Not all stress is equal. Stress to one person is not necessarily stress to another. It varies based on who you are and what your brain perceives as stressful to you. Just because you find yourself in a stressful situation or had a stressful day, it doesn’t mean that your body will negatively be affected by that stress. On the other hand, little stresses and ongoing stress that you barely notice can add up and take a physical toll. Stress is a tricky health parameter to track. Not all stress is stress. Not all stress is equal. And stress to one person is not necessarily stress to another. So how do you know when you are physically affected by stress? And where does a healthy pregnancy come in to it all? Combining the physical toll of stress with the physical toll of pregnancy. 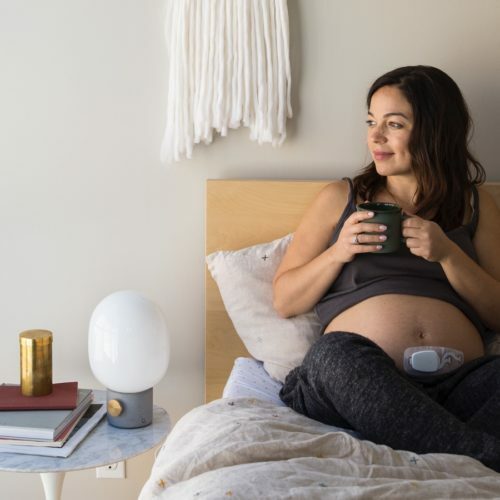 Heart Rate Variability (HRV) is often used as a measure of stress and well-being and is the basis for Bloomlife Mind-Body, a pregnancy-focused, stress management tool currently in beta release. Mind-Body factors in the physicality of day-to-day pregnancy, pregnancy changes, and the physical load of growing a new human and hefting a baby bump around all day. Essentially, we wanted to separate the the mind from the body. 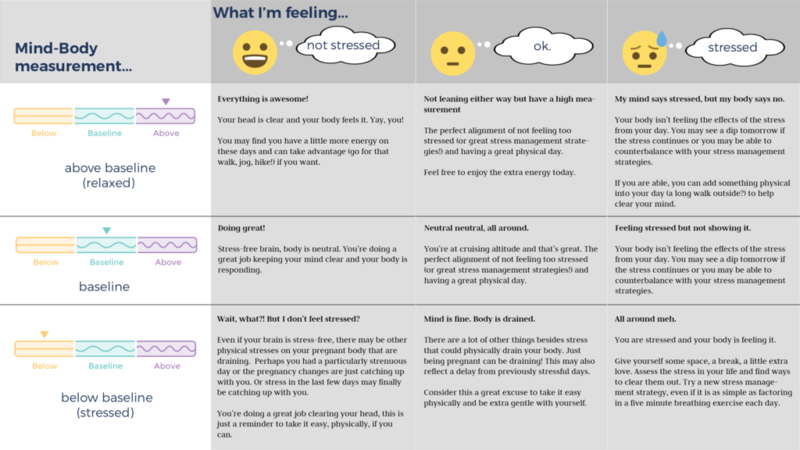 We wanted to provide a better way to see the measure-able, physical effects of your pregnancy and your daily life and provide guidance to help you find balance or set your own stress management goals. When you are using the Mind-Body feature, it is important to recognize that some days your measurement may directly reflect your state of mind (stressful day or not so stressful). On other days, however, it may seem like things don’t align. That’s ok, and perfectly normal. As noted above, the goal of this specific measurement is to separate the mind from the body, the mental load of stress from the physical effects of that stress to give you better and more actionable insight and guidance. 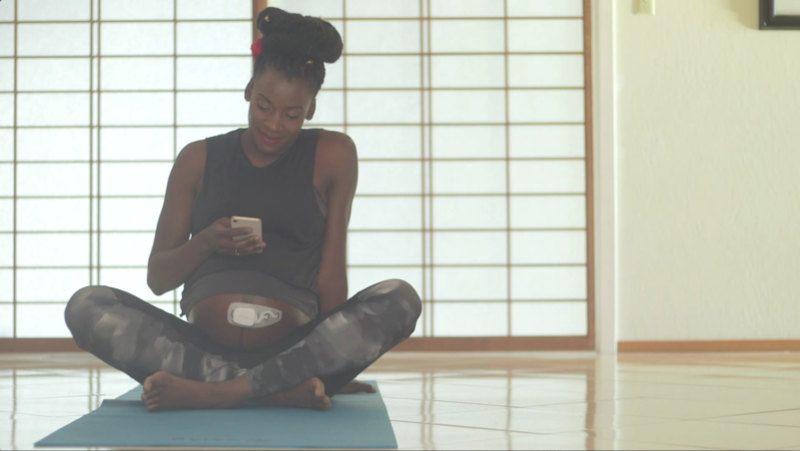 We wanted to provide a better way to see the measure-able, physical effects of your pregnancy and your daily life and provide guidance to help you find balance or set your own stress management goals. The Mind-Body measurement captures and reflects how your body is physically responding to all input. For example, the mental load of a stressful day may be counterbalanced by your stress management strategies or how you personally handle stress. This means that you may feel stressed one night but your Mind-Body state the next morning doesn’t reflect this. This is a good thing. Even though your mind says “stress!”, your body isn’t showing the effects of that stress. On the flip side, this measurement may be tipped by the physical demands of pregnancy, daily life, and/or a few days of low level stress. You may not go to sleep feeling stressed but you could wake up to a measurement reflecting that your body is feeling the effects. This is not necessarily a bad thing but it can be a helpful reminder that you might want to take it easy that day. With Mind-Body, there is no right or wrong, good or bad. Just guidance and insight. A high measurement while feeling stressed could mean that your body isn’t feeling the effects of the stress from your day or that there may be a bit of a delay in how your body physically responds to today’s stress. You may see a dip tomorrow if the stress continues or you may be able to counterbalance with your stress management strategies. Since higher HRV measurements may feel like a burst of energy, these are usually good days to take advantage and go out for a walk or do something physical, if you are able. Since your mind is a bit stressed, its also a good reminder to give yourself some extra space and care to try to keep your Mind-Body measurement in balance. A lower Mind-Body measurement even though you are not feeling stressed may reflect other physical stresses on your pregnant body, a particularly strenuous day or that pregnancy changes are just catching up with you. If you’ve had a string of stressful days, this measurement may also reflect the delay between mental stress becoming physical stress. Feeling less stressed is great and you should keep up the good work clearing your head but try to take it easy physically on these days if you can. Looking to interpret your Mind-Body measurements? Jump to the bottom for the full table. Explain that HRV thing again—How the Mind-Body measurement works. Mind-Body works by calculating Heart Rate Variability (HRV). HRV is often used as a measure of the mental load and physical output of stress since it reflects how you kick on or turn off your physiological response to daily stresses. To dig in, first it’s important to go over how your heart rate is controlled. Your heart responds to two different inputs: the parasympathetic nervous system and the sympathetic nervous system. Perhaps you are familiar with the sympathetic nervous system— this system regulates your heart rate during the fight-or-flight response, the response to blame when you walk up to a podium to speak in front of a crowd and you can feel your heart pounding in your chest. With help from adrenaline and noradrenaline, the sympathetic nervous system is essentially putting a foot on the gas to speed up your heart rate. The parasympathetic nervous system, on the other hand, is the braking system, regulated by the vagus nerve. The parasympathetic counterbalances the sympathetic to get your heart rate back down after a stressful situation. You tend to have a higher heart rate variability you are not stressed. Even when you aren’t in a stressful situation, these two systems work to regulate your heart rate (hitting or releasing the gas, hitting or releasing the brake), and can be observed in the rhythm of your heart beat. When you breath in, your parasympathetic lifts and lets the sympathetic take over for a brief moment. When you breath out, the parasympathetic takes over again. Because your breath is tied to the natural, resting heart rhythm, the normal beat-to-beat interval is a little messy and inconsistent—there is more variability. Therefore, you tend to have a higher heart rate variability when everything is hunky dory and you are not stressed. When you activate your stress response and the sympathetic takes over, your heart rhythm hits the beat in a regular pattern, the beat-to-beat interval is now clean and consistent—there is less variability. Therefore, you will have lower heart rate variability when stressed. The tricky case is when you are at rest but feeling the physical effects of stress— the sympathetic is turned on too often or for too long and your parasympathetic is no longer as effective at counterbalancing. In this scenario, your beat-to-beat interval reflects a faulty braking system and you will have lower heart rate variability even at rest. Your resting HRV is reflected in the Mind-Body state measurement. There are quite a few things that can affect resting HRV in addition to daily stress including sleep quality, nutrition, physical exertion and simply being pregnant. (Since you are sharing your blood supply with a growing human, your cardiac output, heart rate, and the control over your heart change as you approach baby’s due date will shift. Your HRV naturally decreases as you advance in your pregnancy. We built the Mind-Body feature with pregnancy in mind. It specifically tailors to your baseline and makes adjustments for you as you approach your due date. By measuring resting HRV while you sleep, Mind-Body captures how all these potential inputs are affecting your physical state. At Bloomlife, we built the feature with pregnancy in mind, so that it specifically tailors to your baseline and makes adjustments for you as you approach your due date. As with all the choices you make every day of your pregnancy (pizza or salad? nap or workout? ), those small, daily decisions will not make or break your health. But setting a general direction for your healthy pregnancy helps guide those decisions in the context of your day. With this in mind, the goal for stress management and using Mind-Body is not simply to check in with how your stress is affecting your measurement on a particular day (although that is fun) but rather to show you trends across time with daily tips to stay consistent within baseline or improve. A dip here, a spike there, it’s just information to help you make your daily decisions. Interesting in trying out Mind-Body while it’s in beta? Order your Bloomlife here to get started! Song H, Fang F, Tomasson G, Arnberg FK, Mataix-Cols D, de la Cruz LF, et al. Association of Stress-Related Disorders With Subsequent Autoimmune Disease. JAMA. American Medical Association; 2018;319: 2388–2400. Spruill TM. Chronic Psychosocial Stress and Hypertension. Curr Hypertens Rep. 2010;12: 10–16. Kim E-J, Dimsdale JE. The effect of psychosocial stress on sleep: a review of polysomnographic evidence. Behav Sleep Med. 2007;5: 256–278. Dickens MJ, Pawluski JL. The HPA Axis During the Perinatal Period: Implications for Perinatal Depression. Endocrinology. Oxford University Press; 2018;159: 3737–3746. Kourtis AP, Read JS, Jamieson DJ. Pregnancy and Infection. N Engl J Med. NIH Public Access; 2014;370: 2211. Gandhi P, Mehta H, Gokhale A, Desai C, Gokhale P, Shah C. A study on cardiac autonomic modulation during pregnancy by non-invasive heart rate variability measurement. Int J Med Public Health. 2014;4: 441. Aligning mind and body—How to interpret your Mind-Body measurements. What is the Bloomlife Mind-Body?